We're in DC! And there's no more place apropos of this mini menu to be served with the usual hot dogs, hamburgers, and such. Check out the beverages to go along with these scrumptious sides and desserts and enjoy the holiday....we are! chives. Serve at room temperature. 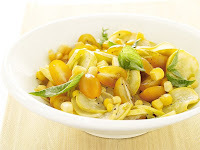 Yellow Trio: Cut the kernels off an ear of corn; sauté in olive oil with yellow squash slices. Toss with yellow grape tomatoes, basil, salt and pepper.